Cyprus has a strong history in wine making, the first named known wine Commandaria is from Cyprus. The past century marked a revival in wine making, after centuries of decline when wine was mostly made for home production. We wanted to promote, and help wine interested people discover the beautiful Cypriot wines and wineries. We wanted people worldwide understand how many high quality wineries Cyprus has and where they are located. Provide related online information about each winery to support further discoveries of Cypriot wine. We wanted people who already started exploring Cyprus wines and wineries to share their experiences with others. 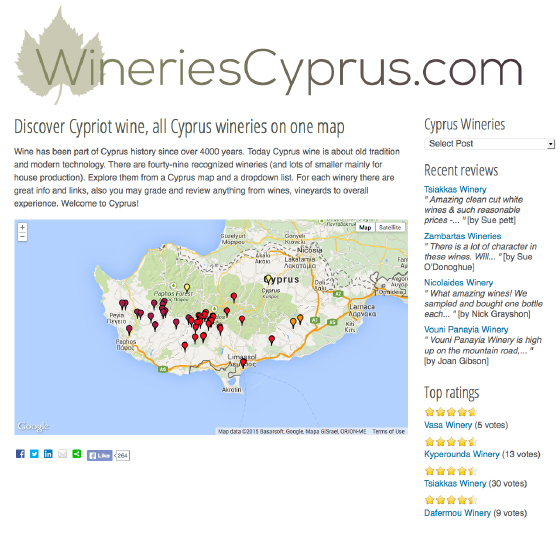 (2012) We created a website with a map over all Cyprus wineries. Each winery got an own page with own map, it’s online presence and contact details. A nice listing of other online information and travel routes/tours it is part of. Website visitors can review and rate each winery. The website is search engine optimized, and has an extended digital presence on social media. During the websites first year the powerful search engine optimization generated nearly 20.000 unique visitors. (No other promotion was made apart from providing it an extended presence on social media.) The website has SERP 1 which means it is on first page on most searches in Google involving wine or winery and cyprus.